The 0°C walk-in cold rooms from Weiber are designed to provide and sustain working temperatures as low as 0°C for the preservation and storage of a wide variety of storage items including poultry, meat, fruits and vegetables, flowers, bakery items, medicines, chemicals etc. These cooling equipments provide a positive working temperature range for the bulk storage of fruits and vegetables, vaccines etc. and a negative working temperature range for the storage of meat products and other temperature sensitive materials. Weiber 0°C walk-in cold room Manufacturers provide these chambers in various sizes and configurations and can be custom-designed to suit specific requirements. Owing to their large storage capacities and flexible design, these equipments find widespread usage in butcheries, bakeries, restaurants, research laboratories, pharmacies, hospitals, mortuaries, flower shops etc. 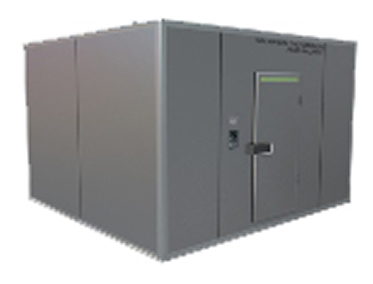 Weiber 0 Degree Cold Room are designed for excellent insulation and refrigeration capabilities. They are made up of prefabricated PUF insulated panels of varying thickness and use pre-coated GI sheets or stainless steel sheets for external and internal surfaces. The stainless steel construction adds rigidity and structure to the equipment and ensures non-corrosive, smooth and uniform external and internal surfaces. The excellent insulation panel provides maximum thermal efficiency and reduces the power consumption. All the walls, ceiling and door are well insulated for minimum energy consumption. The Weiber Cold Room 0 Degree C are available as easy to install, light weight equipments that can be readily assembled using cam-locking arrangement. The units come equipped with an efficient light source and may feature automatic door closers or strip doors and other features to minimize infiltration within the storage area. The equipment uses wall mounted cooling units that are independently controlled by their thermostats for maintaining the temperature of the insulated storage chamber. Most of the available models use hermetic and reciprocating compressors and air cooled condensers for efficient refrigeration. The Weiber 0°C walk-in cold rooms may also come equipped with audio and visual alarms for over-temperature and other out of spec parameters. The units may also be connected to temperature recorders to allow continuous monitoring of the cold room temperature. These cooling equipments come equipped with a wide array of safety features including circuit breaker to prevent voltage overload, low voltage protector to protect the equipment, alarm relay for operating the alarm system, alarm thermostat and indicator lamps for indicating the alarm condition. These pre-fabricated cold rooms feature a simple yet efficient design and are operational with a simple plug-in to a power source. They also come equipped with a defrost control and anti-condensation control to prevent the formation of frost and condensation across the surfaces of the storage items. The Weiber 0°C walk-in cold rooms use a highly advanced control panel for efficient control of the operating parameters. The equipment features a digital thermostat for displaying the actual temperature, allowing efficient control and easy adjustment of the working temperature. The units come equipped with CE certification for quality and safety.